The Major League Gaming Pro Circuit Championship, held last month in Rhode Island, set new records for competitive gaming ratings. This new wave of professional sports is quickly gaining popularity, which some may not consider traditional competition. However, the numbers show that major league gaming, also known as E-sports, is reaching levels on par with conventional sports viewership. 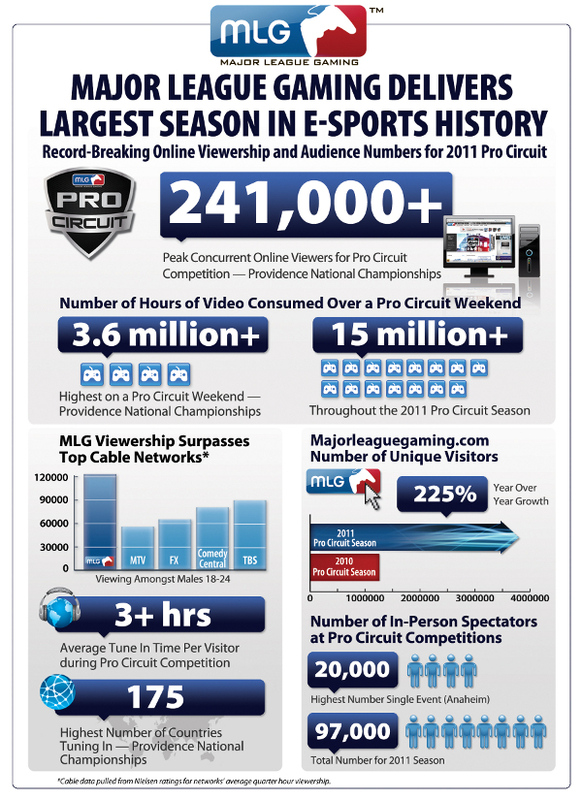 The Rhode Island tournament, one of six held every year by MLG, boasted impressive numbers compared to its previous events and mainstream television network ratings. At one time the number of viewers reached 241,000. Matches during the event, mostly of games such as Starcraft II and Halo: Reach, were streamed by viewers in over 175 countries with average view time being longer than three hours. It is expected that viewership will continue to rise for these events in the coming years. This is a fair assessment to make considering there was a 225 percent increase of unique viewers to MLG events from 2010 to 2011. It is becoming increasingly true that e-sports are becoming more legitimate, not only as skilled competition but also as a means to advertise toward difficult demographics. In males 18-24, MLG event ratings surpassed MTV, FX, Comedy Central and TBS. However, the United States still has a while to go before professional gamers reach a status like those of South Korea, considered the epitome of major league gaming. For South Koreans, professional gaming is the mainstream with two television networks dedicated to e-sports and an Air Force Starcraft II team. It is quite common there for the top players to be followed like rock stars. What does this increasing popularity mean for the future? Several factors are likely to converge that will perpetuate the popularity of major league gaming. It is now possible these days to make a living as a gamer from endorsements and tournament winnings. Just this year there was 15 million dollars in prize money from major tournaments. This lifestyle may encourage more kids to seriously pursue this type of lifestyle and thus lead to more diversified and attractive matches. Meanwhile, technology will continue to improve so that gaming will not only be more entertaining but reflect the skills of gamers more accurately. With rising ratings, advertisement and investment will increase. Right now the video game industry, at 60 billion dollars a year, is already larger than the film industry. Companies that already take part in funding tournaments include Intel, Dell, Samsung and Volkswagen. The time may be soon when Starcraft II and Halo are household names and major matches are broadcasted in similar fashion to the Super Bowl.